So, thanks and a shout out to all those tweeters who recommended this as a place to try when I sent out a distress call on Twitter. North East Londoner that I am, I was a bit lost when heading into the badlands of the South West (of London). And what a happy surprise it was to find them neither bad nor boring. Quite the contrary, a small covered village of cafes and eateries, a market to put Dalston’s Ridley Road to shame when it came to interesting meat and vegetables. Big orange mangoes from India and Pakistan, the best on the planet, okra the size of a tiger’s claw, and many knobbly bitter green things that looked like they were grown in the greenhouses of Venus. I loved it. And of course a good Thai restaurant. I’ll happily cross London to sample their pungent, sweet and above all, well balanced curries. 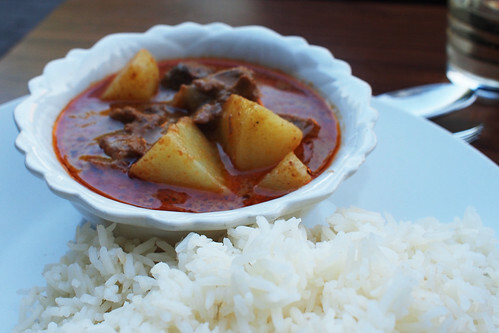 We tried a beef Massaman – succulent and tender beef with potatoes in a salty-sweet and spicy coconut sauce, redolent of pungent fish sauce and aromatic lime leaves and lemongrass. Veggies, don’t be put off by their meat-centric menu. We asked them whether they had any vegetarian dishes, and they said they could make any dish with tofu and/or veg instead of meat and a fish-free sauce. It brought home the joy of simple and swift Thai cooking. The sweet balance of flavours and textures, the almost paradoxical poise and power of a good curry, laced with red-hot chillies and yet bursting with flavour. And it’s BYO, and so very reasonable. Most mains were around the £6-7 mark, starters £4-£5. We sat outside enjoying a parade of small starters and generous mains, watching the world go by, listening the the strains of a Spanish guitar from one side and pounding dub from the Jerk chicken joint on the other. I loved every minute. 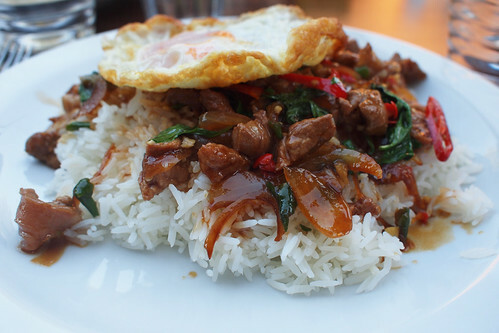 This is on my list but I think there are other decent Thai joints in London. I accept that they’re hard to find, but they do exist, for example 101 Thai Kitchen on the borders of Hammersmith and Chiswick. BTW – when you get back, do check out the Colombian butchers in Brixton Village. ohh you found one! congratulations! It is a faaaar way to Brixton but for a good Thai place it seems worth it. How’s China? 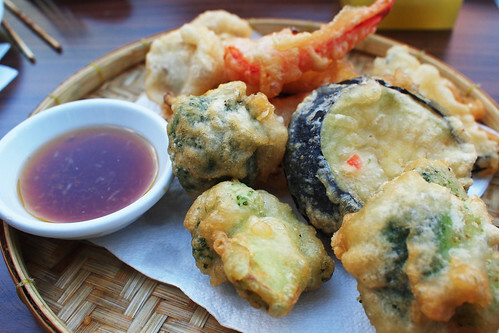 Brixton is beginning to become a small mecca for good small restaurants. I am enjoying going there more and more now. I fell out of love of Thai food, but slowly getting back into it again. This place os def on my list…. On my list to try. Actually, all of Brixton is on my list to try! Let’s go make some expeditions when you’re back from your giant one! @Mr Noodles – I have heard about those, but they are so far west! I probably wouldn’t have made it here were it not for Suede. But I am so glad I did, and will try toget back there when are back in London. @Goig with my Gut – yes, lets! There was a whole host of wee little eateries that looked pretty damn fine. And the mangoes… So beautiful! I heard lots of gossip about kaosarn consequently went there last saturday for a meal.I had thai green curry chicken and sticky rice.Rice was really like a chewing gum and green curry no taste service was disgusting i would not recommand to go there. This is some very good information. 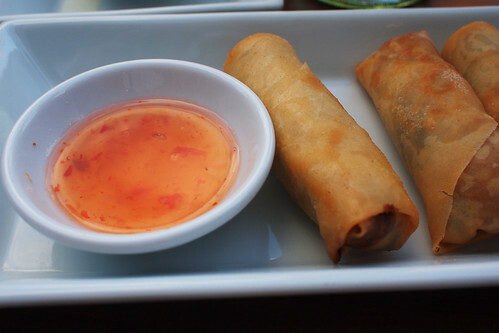 Asian and especially Thai food is gaining in popularity world wide. This site is helping. I personally, having visited this restaurant on two occasions would suggest that it be avoided…the food is good enough, but the staff are exceptionally rude and determined to create a bad atmosphere, one the basis of my experience yesterday, where I was quite literally scorned by a member of the family for asking to sit in a window table, with no reservation card on it, and told to “sit where I’m told to sit”! This establishment doesn’t deserve to receive such high ratings if it means they are under the mistaken belief that they can treat customers so badly. Understandably, I walked out on this occasion, and asked them why they were being so rude. I only wished I had done so on my previous attempt to have a pleasant meal there, when I had to wait for an inexcusably long time for my food, while having to endure table after table of other diners being served before me. When I politely pointed out that I had been waiting for rather a long time for them to even TAKE My Order, they were very brusque with me indeed. Not good enough, folks! @Jason and @Kras – that does not sound good. Really sorry to hear that the service and food you had there were not good when you went. It’s odd, the food and service I had were great tbh. But I guess there is no guarantee that service etc will be good all the time.